Canadians continue to embrace newspapers in print and digitally. In addition, ad revenues also remain solid. 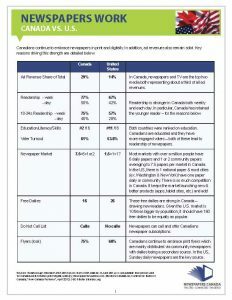 In Canada, newspapers and TV are the top two media both representing about a third of all ad revenues. Readership is stronger in Canada both weekly and each day. In particular, Canada has retained the younger reader.